Real Estate Professionals | Sweet Home Inspections, Inc.
We are property inspectors by profession, not as a hobby or part-time endeavor. We seek continuing education in our field, we get licensed or certified where appropriate, and we work with others in our field to raise the level of quality and ethical conduct all property inspectors should be held to. 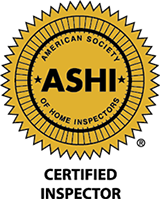 We not only belong to The American Society of Home Inspectors (ASHI), but all of our inspectors are affiliate members of KCRAR. That means that we are abiding by the rules and behavior of an affiliate of KCRAR. We provide (in our opinion) the best home inspection offered anywhere in the Kansas City metropolitan area, and we would be willing to go head-to-head with other inspectors outside our area too! We protect you and your clients by carrying Errors & Omissions insurance as well as Liability Insurance. Our E & O insurance will cover you and your broker if there is ever legal action concerning the inspection. We don’t use scare tactics or insert our personal preferences into our inspection reports. We provide an objective review of the condition of the home and we provide the information your clients need to make an informed decision. We price our services competitive to our industry, so that we will be in business tomorrow, and next year, and the year after and can continue to provide great service to your clients. We would love an opportunity to be part of your team. Give us a try and see the difference yourself.